Frisky is one of my favourite places for a healthier-than-icecream treat in the warmer weather thanks to their delicious froyo or frozen yogurt. Luckily they also sell quirky bubble tea and fresh fruit smoothies for when it's not yet appropriate to sunbathe in the Meadows or Princes St Gardens. This morning I attended Frisky's smoothie tasting session on Lothian Rd to try exciting new flavours as well as the ones already available at the store. My favourite was the pink one - surprise surprise. 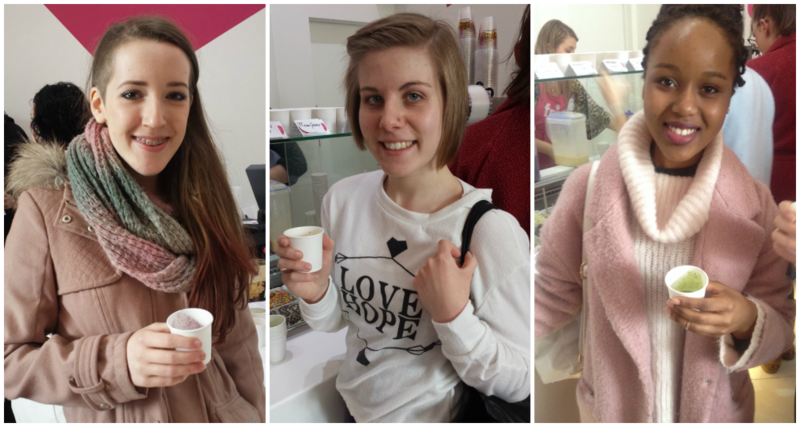 Everybody was given a feedback form and we had to rate the smoothie samples on Appearance, Flavour and Overall with a section for comments too. I'm pretty sure I just wrote "IT'S PINK." for the Rhubarb, Strawberry & Ginger which was definitely my favourite. My second favourite flavour was Caribbean Crush which is currently available in Frisky. It contains mango, pineapple, banana, passion fruit, nutmeg and froyo and is a brilliant bright yellow with black specks throughout. It reminds me a little of a speckled mini egg (p.s. it's almost Easter yay chocolate). I was joined to the event by the lovely Cera K who had her snazzy rainbow holographic Topshop shoes on to accompany her pink and fluffy outfit as she had a fashion show for Edinburgh Fashion Week in the afternoon. I can't wait to go to the Thistle Row show tomorrow - anyone else going? My friend Ellie also came along to the event and afterwards we enjoyed a lovely lunch at Wagamama just down the road. Wagamama and Frisky make a rather good combination that I'll most likely try again in the very near future. The yasai katsu curry is out of this world - just saying. These are our 'why yes I will have another free smoothie' faces. One of my favourite things about Frisky is they have a selection of games on the counter for you to play while you sit in with your treats such as dominos and scrabble. If Frisky was a person they'd be a lad for sure. If you'd like to visit another fun Frisky event, they are planning an 80s themed "extravaganza of music, froyo and bubble tea" to fundraise for Red Nose Day on the 13th March. Click here to book your free ticket now!